Hey all! Starting a WIP of my... 4th? Official kit! The goal with this kit is to go back to a relatively clean (build not weathering ) modern style mando that is focused on build quality in order to re hone my skills as a Ruus'alor Sol'yc and as a general builder. A large portion of the accessories to this kit will be 3D printed by myself. This thread will largely be an info dump for now till I get the soft parts which will easily be the longest wait for the kit to be completed as some of the people making them are pre-disposed until after celebration. **EDIT AGAIN** The plan is for this to be an extremely picture and information heavy thread, almost to create a detailed experience of building a kit almost like a tutorial, (but not quite) Buckle up! Blasters: Blasters have been chosen, but will be kept secret till both are completed! Grenades will most likely be Death Trooper style (3D printed) Or possibly small custom greeble builds! On the flak vest and flight suit, I will be having them made in ROTJ Fett colors at the moment, that could change in the future. Armor colors are going to be done in airbrush with the humbrol line, largely pulling colors from ROTJ Boba, but not used in the same way. I will be getting my paint tomorrow and painting the helmet to get an idea of the pattern. Right now The main colors to be used will be RLM #78 as the primary armor colors, #154 yellow as the T accent, shoulders, and knees, mandible arcs in #33 black, Cheeks in either #34 white or RLM #78. Some small hand detailing, kill stripes and other wise will be done in #154, some shading and possible subdued "sky camo" type patterning to be done in #89. *EDIT* Picked up the paint palette today! Leather soft goods in a brown leather similar to ROTJ Boba. I decided to go about and hand scale and then draft my own templates for my plates because I personally dislike using the templates available because I have to trim them too much and the details end up getting distorted slightly on the plates after you've removed too much. That's all for now! Will update as it comes along! Current Armor WIP - Legacy Privateer. 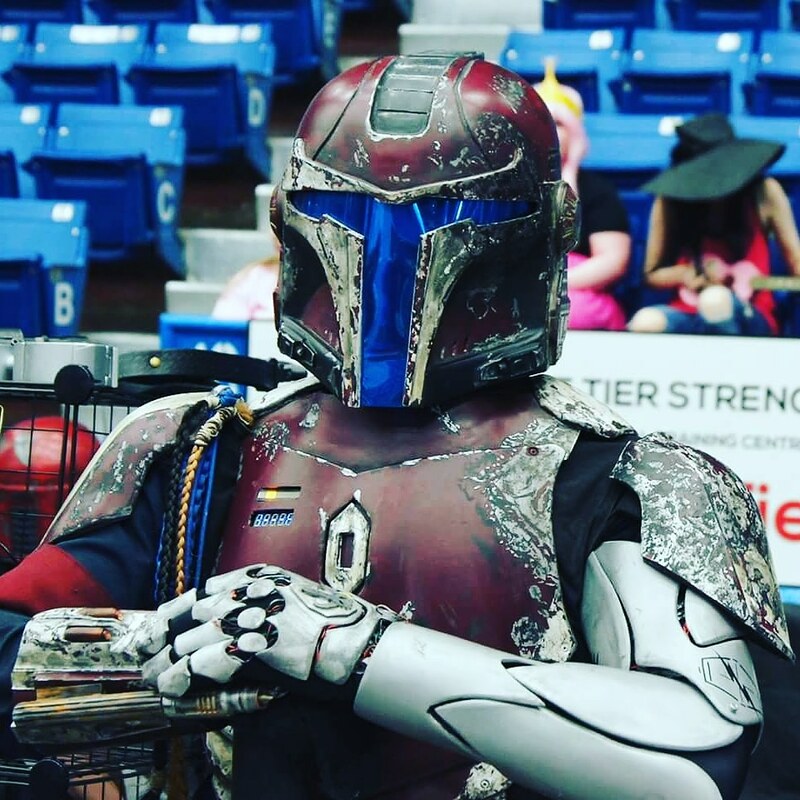 Project Corsair, a helmet for the tactical mandalorian. Torso and Bells are cut out and shaped, just have to do a bit more feathering sanding on the edges to get the rounded look I'm going for! Started playing around with the paint on a scrap shoulder bell to try and get a feel for the spraying and the topical weathering. Need to figure out my layering a bit more, but I like it. Painted the helmet, messing around with topical weathering and airbrushing instead of masking style. For a first, I will ACTUALLY be trying to make this kit relatively low damage, but still nicely aged. I feel like the blue on the back is a bit too strong, but now sure what else I'll do there. Might grey it out a little bit, or just repaint it with the same color as the top of the helmet. 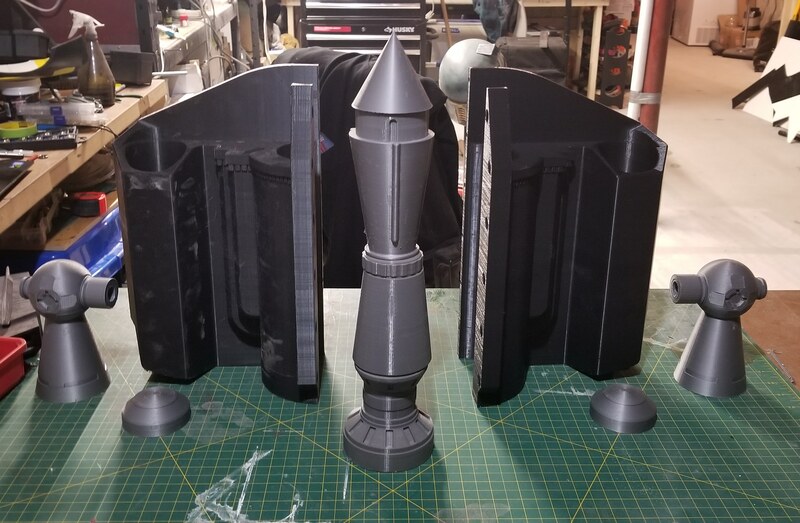 Z-6 Jetpack is all printed! 260 ish hours and 3kg of filament later! Just need to get the PVC piping for the rocket structure and them assemble and sand. Did some back plate work. I opted to do a cut in style to simulate a Jango back plate without it being vac formed so that the jetpack would rest straighter and not give me humpback jetpack! Also played around with my "light weathering". I usually go very heavy on damage so this time I had to tell myself "THATS ENOUGH" on it... My model here, B'ob, was being a bit moody cause I dirtied him up!